As I mentioned in my previous post, one of my upcoming projects for this month was to work through the Christmas gift I received from my business partner Megan, and goal-oriented workbook called "2016: Your Best Year," by Lisa Jacobs, a creative marketing consultant, blogger, teacher, and all-around business power-babe. I dove in this week and completed the first section, and am already so pleased with how it's going! The description on the back sums it up with shine of course, to quote, "Your Best Year is an annual workbook designed to make your starriest dreams and most ambitious goals come true. It's for creatives who are ready to stretch their comfort zone and make it happen already...Your Best Year 2016 is here to help you review what's working, change what's not, and bust your business ruts once and for all!" It makes a lot of big promises, but I am thoroughly impressed with how it works through them. In the first section, called "Review" it guides you through several steps to review your previous year. One was a "best/worst" exercise: what were your best/worst memories; best/worst uses of time; best/worst uses of resources; goals achieved vs. goals failed; obstacles overcome vs. unfinished business. It was refreshing to review the things that went well and reassuring to see how large those categories were; so often we focus on the negative and trying to fix what's not working, that we fail to see what is! Furthermore, it was so fascinating to see what things/events/ideas spread out across everything! My wedding was something that appeared in almost every single box- all the way from the very best memory to the thing that stressed me out the most- and this in turn helped me to truly realize how this year already will inherently be easier due to that huge life event not being a demand for time and energy. Another portion was to review your business policies from the previous year and then write out those policies with any updates for how you will operate in 2016. This includes things like ways to best reach me, return/exchange policies, shipping policies, and personal policies on doing work for free. This is so smart- there is no better time to update these policies than at the beginning of the year, and to start the year with a slate cleaned of last year's policy issues. The final and big section of this review was an exercise called "If I could not fail, I would..." This is what I feel was the crucial and juiciest part of the first section. Lisa Jacobs challenges you to brainstorm what big dreams you would tackle if you knew you could not fail, and then utilizing her step-by-step breakdown, guides you through writing an action plan for making one of them your utmost goal and seeing it through to completion. For me, this was the part that put all the pieces together and led to my list of 2016 goals for my business. Lisa uses a 3 prong approach to help lay out the plan: what could happen in 3 weeks, months, and years; what steps can you take toward those goals in the next 3 weeks, months, and years; and what positive impact will this have on your business in the next 3 weeks, months, and years. For this first run-through the exercise, I choose a goal that has been long on my docket: to produce batches of my bags in all of my available leather colors, so that when I go to a show I have those top-sellers in every available color, as well as be able to make all of my products ready-to-ship instead of made-to-order on for my web-shop and my Etsy! Using this as the goal, I was prompted to lay-out a plan for how to achieve it. The process was so different from other goal-setting exercises I have done, as it was so in-depth and thoughtful, and broke it down into manageable chunks and questions instead of just being this big grey "goal" thing. Questions such as "What results do you anticipate from this?" "What do you have to complete in the next 3 months to get started on that?" "What do you have to complete in the next three weeks to make progress?" and "What are best and worse case scenarios of if I do/if I don't meet this goal?" Breaking it down section by section made it easier to digest and truly think! 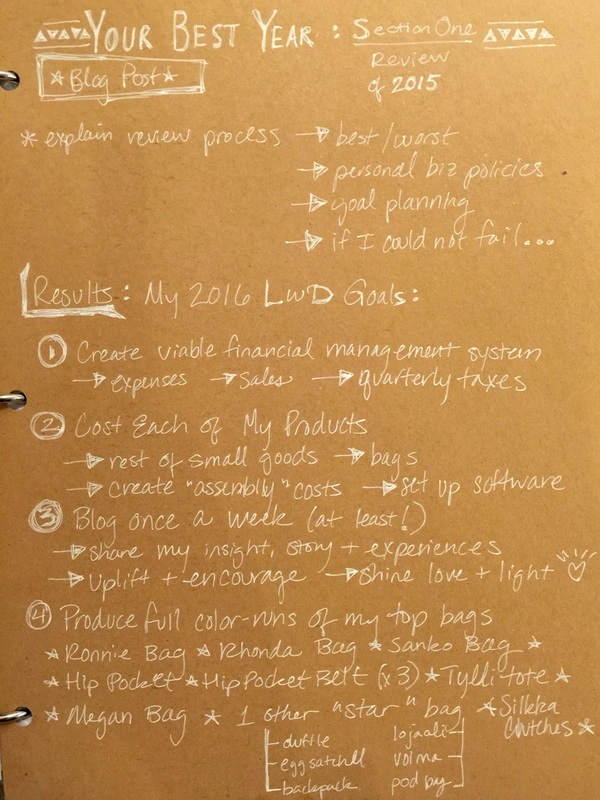 Jumping off from there, I used the combination of the sections to come up with the following list of business goals for Littlewings Designs for 2016. Lisa Jacobs recommends having separate sets of goals for the different facets of your career/business, as well as for your personal life, so that you don't end up with an over-whelming goal-mountain instead of manageable goal lists. 1. Create a viable financial management system- one that accounts for all expenses + incomes in one place, and keeps my books up to date so that I can pay quarterly taxes. 2. Cost each of my products, then create "assemblies" from them and set up the manufacturing accounting software my mother (and accountant!) bought for me. 3. Blog at Least once a week- utilize this space to share my insight, story, and experiences; uplift + encourage my fellow creatives; and spread love + light. 4. Produce full color-runs of my bags. These colors batches will include the following bags in each batch: A Ronnie Bag, a Rhonda Bag, a Sanko Bag, a Hip Pocket, a s/m/l size run of Hip Pocket belts, a Tylli Tote, and Megan Bag, and one other "star" bag such as the Voima, etc. I have always wanted to do this to move my sites over to ready-to-ship bags, and have a flush stock for my storefront and markets! 5. Update my sites to "ready-to-ship" only! See above! 6. Have a full photo-shoot with models and bags. This is another long-term goal of mine that has always seemed out of reach without a large color-array of my bags made and ready to make it worth hiring a model and professional photographer. 7. Give myself a $300/mo raise. Frankly, this should probably be higher up on the list as it's a huge priority for me, but I also know if won't happen if the goals above aren't met first. I would ideally like to give myself a raise so that I can start a savings account to buy a house! 8. Have a $5,000 gross sales show or market for Littlewings Designs. This is another goal that I have felt would not be possible without a full-array of my bags in-stock. 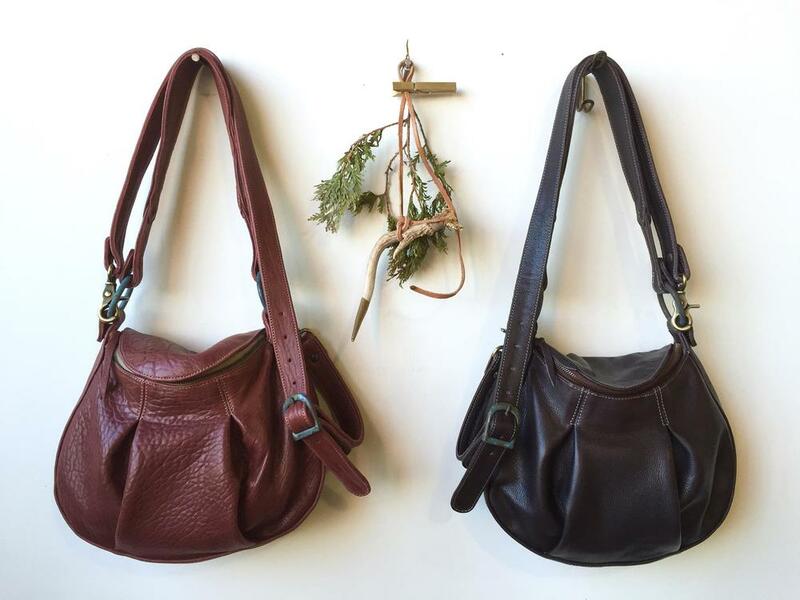 While I always sell a great volume of small goods at my shows, it's those bag sales that really tip the scales of into the profitable favor at a market. Having a better stock of bags is going to help make this possible this year! These are some big goals, but the process of this workbook is making me realize that it is possible to meet them! I'll be working through more of it this coming weekend, and will share another update next week. But next on the blog? A switch over the spiritual journey as I share my readings thus far of "The Evolutionary Guidebook." Be on the lookout for that this Sunday. Thanks for reading, and wishing you love + light this weekend!